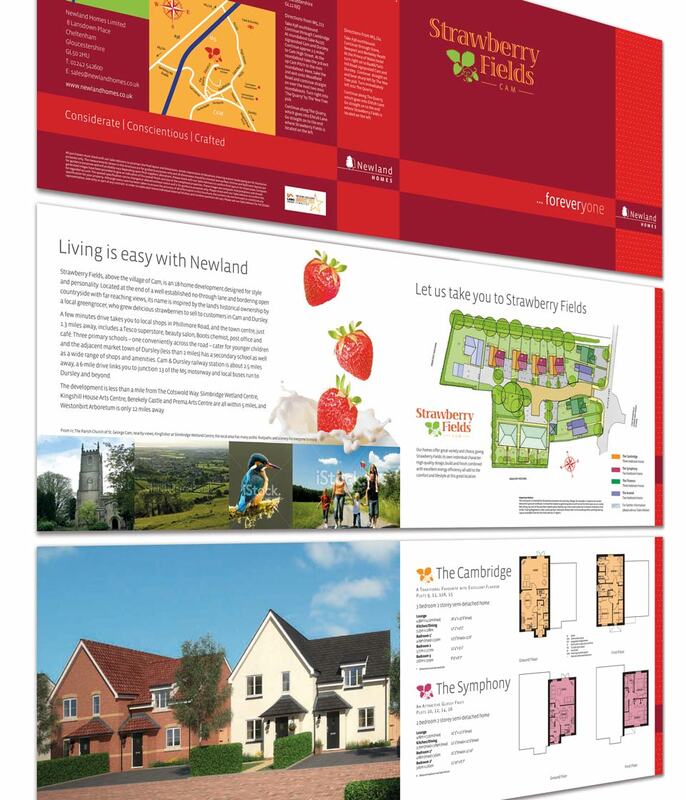 Newland Homes, a prestigious house builder in the South West approached PRH Design for marketing collateral and identity for their new development Strawberry Fields in Cam, Gloucestershire. To create brochures and signage for the development which contains semi-detached and detached homes on a small rural site, previously used for fruit growing. House buyers in the area, requiring 2 and 3 bedroom homes. They want quality and excellence of design but at an affordable price. These are nicely designed houses within a quiet and attractive environment but at an affordable price. Each house feels individual and a lot of thought has gone into the design and specification. It’s not a run of the mill development from a PLC developer. The brochures and imagery are clean and stylish with clear and precise layouts of the different house types and plans.